Instant Pot Butter Chicken - the best Indian butter chicken recipe with rich, creamy and delicious tomato butter chicken sauce. This easy recipe takes only 10 minutes in an Instant Pot! 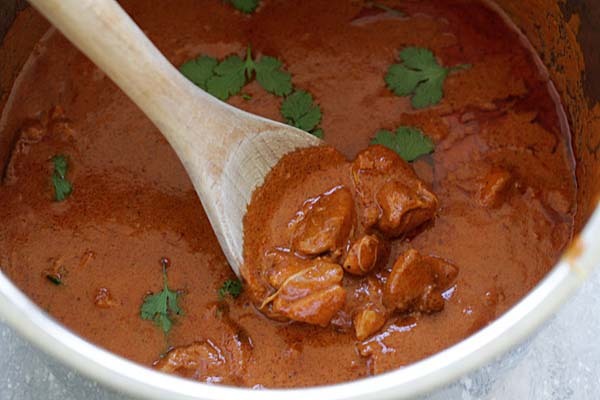 Butter Chicken is a creamy Indian chicken curry commonly found in Indian restaurants. It’s usually served with naan and basmati rice. Learn how to make Butter Chicken with an Instant Pot with this easy and authentic recipe. 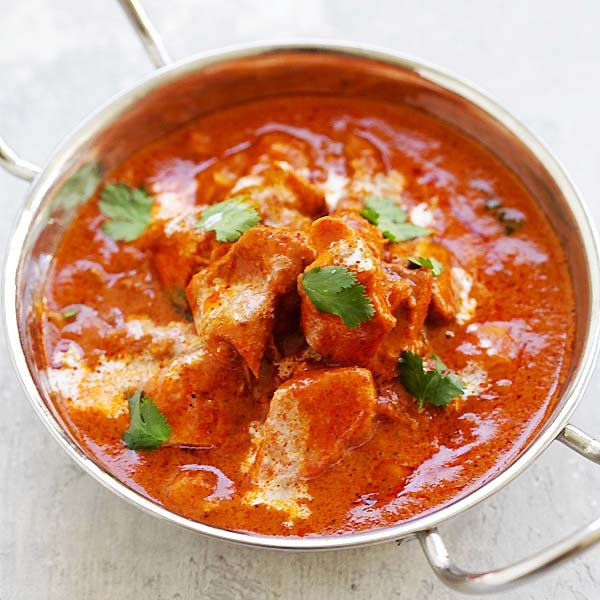 I love Butter Chicken and it’s one of the dishes that I always order at Indian restaurants. Butter chicken is similar to Chicken Tikka Masala but they are different. As the name suggests, Butter Chicken uses butter and less spice-laden while Chicken Tikka Masala is heavier on the spices. Both recipes call for Garam Masala, which you can buy online or at the spice aisle of food stores. This amazing spice mix gives you the iconic Indian curry flavor. 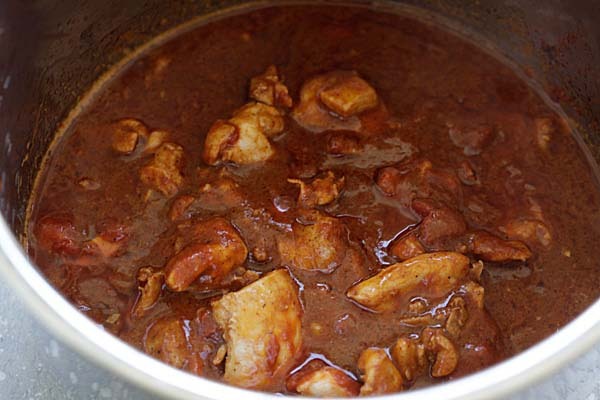 Other key Butter Chicken ingredients include tomato paste, ginger and garlic. How to Make Butter Chicken in Instant Pot? With an Instant Pot, you can make this rich and mouthwatering chicken curry at home in a jiffy. First, you prepare the butter chicken ingredients by marinating the chicken first. Saute the chicken with butter, then add all the spices and pressure cook for 10 minutes. Add the heavy cream after pressure cooking and you will have the best homemade Butter Chicken that tastes just like Indian restaurants. For serving, you can try my homemade naan recipe or just serve with rice, preferably Basmati Rice. 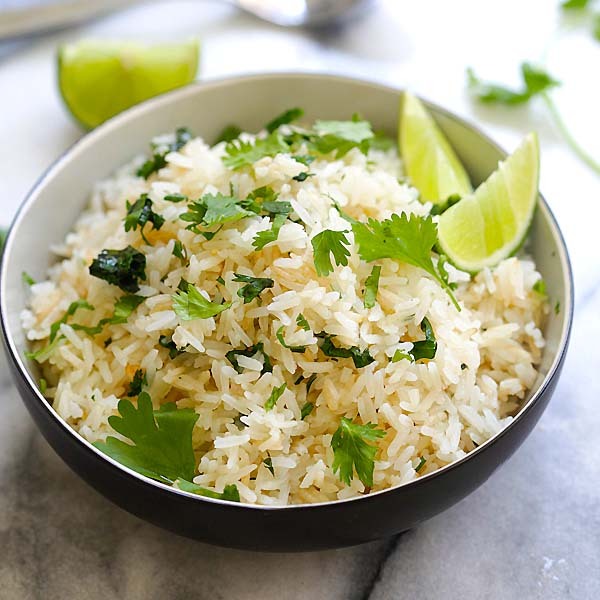 The taste and aroma develop overnight so save your leftover for lunch tomorrow. You will love the flavors, enjoy! Want a new Instant Pot? Enter to win Instant Pot 6qt Pressure Cooker. Click here or the image below to win! Instant Pot Butter Chicken - the best Indian butter chicken recipe with rich, creamy and delicious tomato butter chicken sauce. This easy recipe takes only 10 minutes. Trim off the excess fat on the chicken thighs with a pair of kitchen scissors. Cut into chunks. 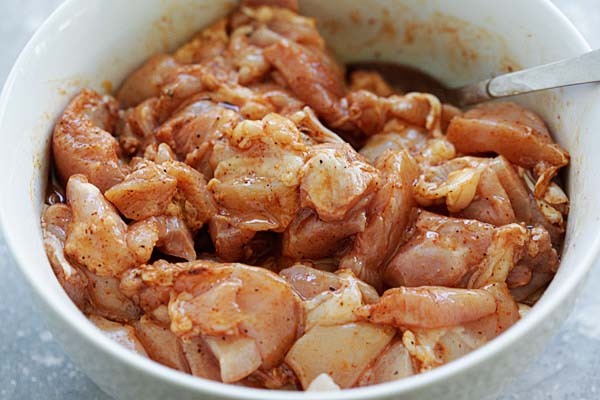 Marinate the chicken with 1/2 tablespoon chili powder and lemon juice. Set aside. Turn on the Instant Pot and set to Saute Mode. When the pot is fully heated, add and melt the butter. Add the garlic, ginger and stir a few times. Add the chicken and saute until the surface turns white. Add the remaining chili powder, tomato paste, ketchup, Garam Masala, salt, sugar and water. Cover the pot and select Manual and set to High pressure for 10 minutes. When it beeps, turn to Quick Release. When the valve drops, remove the cover carefully, add the heavy whipping cream and chopped cilantro, stir to mix well. Drizzle more heavy cream on top the the Butter Chicken before serving, if you like. I used a 6-quart Instant Pot. You can skip Garam Masala but this spice mix is what gives Butter Chicken its iconic Indian flavor and aroma. You may use chicken breasts. If you use frozen chicken, increase the pressure cooking time by 50%, or a total of 15 minutes. If you don’t have an Instant Pot, you can make this Butter Chicken on a stove top using a pot. Simmer on low heat until the chicken thighs are cooked through and becomes tender. REMEMBER TO SUBSCRIBE TO RASA MALAYSIA NEWSLETTER AND GET EASY AND DELICIOUS RECIPES DELIVERED TO YOUR INBOX. If you try my recipe, please use hashtag #rasamalaysia on social media so I can see your creations! Follow me on Facebook | Instagram | Pinterest | Twitter for new recipes, giveaways and more. All photos and recipes on Rasa Malaysia are copyright protected. Please do not use the photos and recipes without prior written permission. If you wish to republish this recipe, please rewrite the recipe in your own words instead of copy and paste and link back to //rasamalaysia.com/instant-pot-butter-chicken/. Thank you very much! You had mentioned parsley instead of cilantro during the finishing steps. Also, any reason for not putting yoghurt in the recipe? Oops, it was a typo, it’s cilantro. You can use yoghurt too but I used heavy whipping cream. I’m making this today as soon as my thighs thaw!! May give a naan a try too, yaye! I’ll be back to let you know how it was, it looks so fun and amazing! That’s awesome, let me know how the butter chicken turn out. Just wanted to double check the amount (or type) of chili…it seems like a lot! I’m just worried it’ll be really spicy. Is it the same kind of chili powder that you’d use for a Mexican dish? Just regular chili powder, like McCormick Chili Powder. It’s not spicy at all, my 7 years old can eat without any problem. Don’t use that much chili powder it would be much better with 2 1/2 Teaspoons, it is way too hot, i can eat it but the rest of the family could not. and they are eating toast now. Unless it is supposed to be paprika which makes more sense, as butter chicken is the mildest of the indian meals. normally the one the kids order. YUM! Loved this recipe so much! Just got an Instant Pot for Christmas and had never used Saute before, so fun! My husband liked it and he is hard to please! I am currently drinking the leftover sauce and am so happy! Great recipe, thanks!!! Thanks for letting me know how to make this butter chicken without an instant pot. Yes you can use stove top to make this butter chicken. Which brand of instant pot would you recommend? Sounds delicious. What sort of pressure cooker do you recommend? I use Instant Pot. You should get one! Hi Jack the nutrition is below the recipe. The label is there. Go to Amazon. That’s where I found one for my son as they were out of IP.s everywhere. This recipe is so rad. Easy and turned out beautifully. Thanks so much for sharing your knowledge with the rest of us. 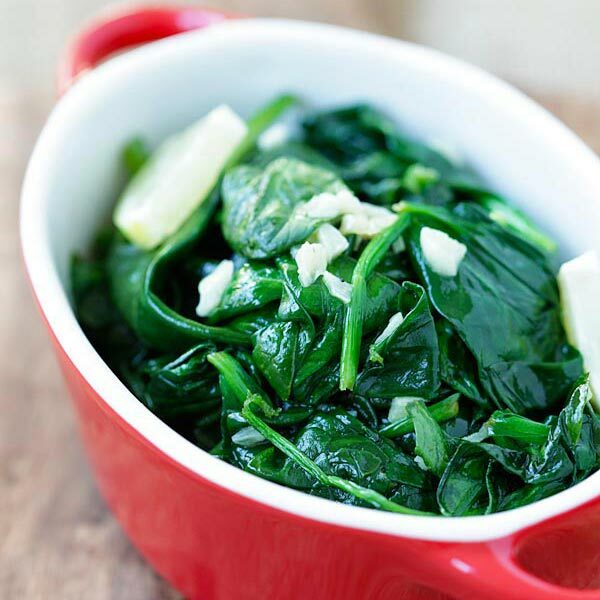 My family loved this and said this recipe is a keeper! Hi Deborah, that’s great to know!! Thank you for trying my Instant Pot Butter Chicken recipe. Tried the recipe yesterday and it was delicious. We often try your delicious food like the chili con carne and it is always a great success! Hi Jane, thanks for trying this Instant Pot Butter Chicken recipe. I am glad you liked it. Has anyone doubled this recipe? I want to but I’m worried about the measurements being off. struggling a bit with the recipe, 70 grams is not 1/2 cup of tomato paste, should be 170 grams i believe. I used McCormick Chili Powder and it wasn’t hot at all and my 7 years old loves it. The thing about chili powder is that some brands are hotter than the other. Roger, in the US, we have a small can of tomato paste which is labeled as (6 oz/70 g can) and when you measure it with a cup, it’s 1/2 cup. Yes cilantro is not parsley, and it’s called coriander outside of US. It was a typo that I typed in parsley. I have corrected it. For the chili powder, you marinate the chicken with 1/2 tablespoon, which is very little for 2 lbs of chicken. Then 2 tablespoons for the sauce. It’s not hot, my 7 years old loved it and asked me to make twice already. The thing with chili powder is that it depends on the brand you use. US chili powder is mostly not spicy at all. Not sure about Australia. I am going to try it again but i will use 2 tablespoons of paprika (Dried Red Bell Capsicum) for the sauce and marinate the chicken with half tablespoon of chili powder as the chili powder in Australia is dried and ground chili only and it is hot. I read a forum and it states as below. And in the US, Chili Powder is a spice blend that may contain chilli, cumin, garlic, oregano and salt. whereas in Australia we simply call ground chillies with no other ingredients, Chilli Powder. Hi Roger, good luck, let me know how it goes. Hi Bee, this has become a family favourite over about six months now and I’m about to make some more! I also use your naan bread recipe with this and all of a sudden, I’m the greatest husband/poppy in the world! They really go crazy over this recipe, thanks for sharing from Australia. Hey Darryl, so great to hear your success with my IP Butter Chicken and naan recipe. Yes they are great together. Thanks for your support. Rasa Malaysia! Yet another great recipe, thank you from Canada! Made this for our family of 4 using an 8 qt IP and will add this to our family menu… keep up the great work!